I'm new here, and have been reading Meta questions and such as I try to get a handle on things like answers vs comments, what's on topic, etc. I greatly appreciate the thought that has clearly gone into the shaping of the site (even when I don't always agree with the outcome). Many of the answers here in Meta and also comments on "bad" questions point new users to the Tour, so it seems like it would be in everyone's best interests if the question featured there actually represented current best practices. Is it possible to fix this? **Edited title and tags to reflect suggestions by @DanBron and @SvenYargs, and to not bury the lede. The Tour page describes editing others' questions and answers, but it doesn't mention one of the most important editing functions: editing your own post, especially to incorporate suggestions in the Comments about how to improve your post. I'd list this as the first explanation on editing. After all, the Tour is primarily for those who are (a) new (or relatively new) to the site, and (b) have at least some degree of interest in how the site works. It's this latter 5% of new users who would most benefit from highlighting this self-editing expectation. To expand on part II of Rathony's answer, how difficult would it be to engineer ELU so that a pop-up message appears when a low-rep user commences a question or answer, presenting a couple of really basic dot points - e.g. a note that ELU isn't for opinions; a link to How to write a good question/answer; a link to ELL. It wouldn't stop flagworthy posts, but it might reduce the flood. Is such a structural enhancement possible for just the ELU site? Detailed explanation on the differences between ELU and ELL and a link to ELL for learners. A few good example questions that are well researched with clear context. 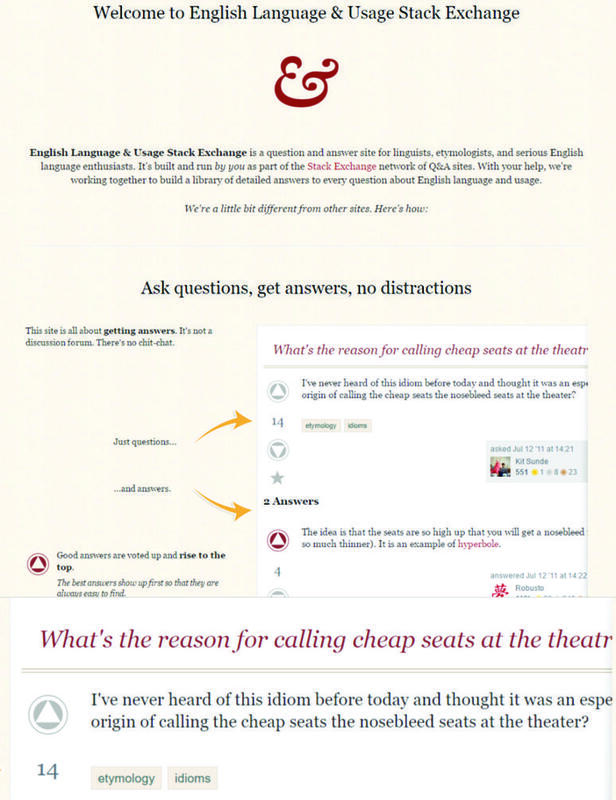 A guide to use the search box encouraging new users to search a key word or phrase before asking a question. A sentence emphasizing ELU is not a discussion forum and any question seeking an opinion is off-topic. A sentence emphasizing "What does XYZ mean?" or "Proof-reading request" type of question is off-topic unless well researched and a specific source of concern is identified. The above was intended to attract upvotes. I doubt many new users are reading the tour page and guidelines on our Help Center. If they did, a majority of questions would not be posted in the first place. More than 80 to 90% of new users don't come back after posting one new question. I don't think changing the tour page would be as much effective as we expect. (1) make a specific comment that mentions a related guideline so that new users can edit their question. For example, Questions on choosing an ideal word or phrase must include information on how it will be used in order to be answered for Single-Word-Request questions. (3) put low-quality questions on hold as soon as possible if no edit attempt is made. (4) edit a question proactively when it looks salvageable by editing. We need more participation of experienced users in helping new users get familiarized with the ELU's guidelines and standards.